Here comes the perfect time for walking around Kiev. There are a lot of atmospheric and unconventional parks in the capital. Which one is worth going at the first warm weekend, is in our selection. 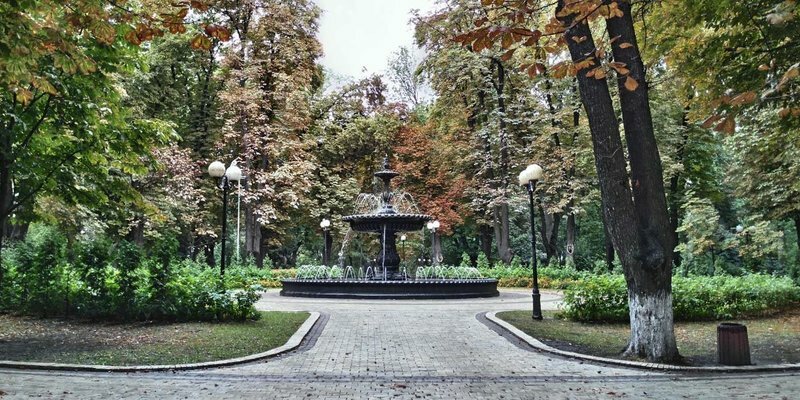 Mariinsky Park, Glory Park and Shevchenko Park can compete for the status of the most beautiful, aesthetic and well-equipped park in Kiev. These islands of greenery in the center of Kiev, probably, are known to all. But, nevertheless, it is always worth returning here. After all, the unique spirit of Kiev is concentrated in these recognized works of landscape art. Mariinsky is alleys, a beautiful fountain, about a hundred kinds of trees and a special atmosphere. Why is it particularly attractive? Because of its greatness. It is located in the heart of the governmental district. Walking along the cozy trails near the Verkhovna Rada gives a feeling of involvement in the creation of modern history of Ukraine. But not only that, makes it beautiful. Mariinsky is a wonderful European example of landscape art of the late XVIII century. In this style, plans were developed for the ceremonial residence of the most influential states of Europe - Austria, France, and Germany. The whole complex composition of the Mariinsky Park is formed around the palace of the same name (the current ceremonial residence of the President of Ukraine). In addition, Mariinsky Park, together with City Park and Khreschaty Park, is the central park system of Kiev. Walking along these places, smoothly flowing into one another is an excellent program for a lazy sunny day off. Here are both panoramic views of Kiev, and interesting architectural structures led by the magic Puppet Theater, legendary sculptures and monuments of different eras and, for example, such a fashionable youth attraction as the Bridge of Lovers. It is a park with the best infrastructure, and an art-area with designer benches and statues claiming the title of "modern work of art". Shevchenko Park was laid out in the middle of the XIX century on the site of a wild wasteland before the main university of Ukraine, thanks to the decree of the Brazilian emperor Don Pedro, who officially stayed in Kiev. Now there are not only the most beautiful alleys, but also interesting sights of our time. For example, the birdhouse-library and so far the only mirror-like kiosk in the world that was designed by Klaus Lefo. Such kiosks are planned to install in the best parks in New York, Barcelona and Los Angeles. Also traditionally, there are arranged street entertainment events: amateur chess championships, various dance master classes, etc. A stunning observation deck, romantic gazebos, long alleys with different benches and an interesting children's playground - a walk through this park gives an exuberant feelings. Designed as a symbolic monument to the Unknown Soldier, it has turned into a very pleasant place for rest and visits - you can walk around for miles and miles, finding a very special atmosphere in different corners. 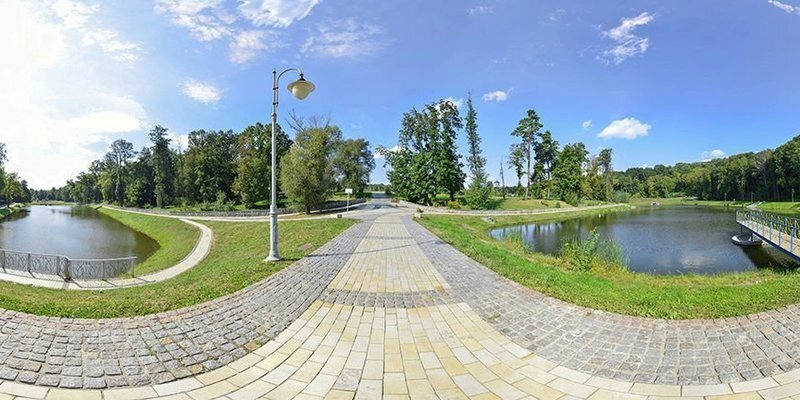 Park of Glory is located on two terraces above the Dnieper between the Dnieper Descent and Lavra Street - these parts harmoniously contrast with each other. There is a wide ground on the Dnieper slopes with grassy lawns and winding ladders between them. 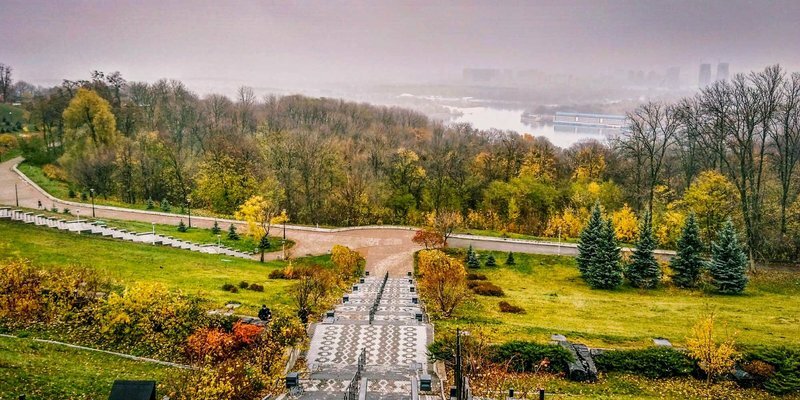 And the lower part, laid horizontally, is separated from the Dnieper descent by the wings of trees and adjoins the Askold grave, an important historical area of our capital. Another luxury place for walking, that is hiding in the bowels of the governmental channel. This small park for some reason cannot be found in any address books - it does not even have a name. Local call this oasis simply "park-yard". But, nevertheless, it is well-groomed, and at the entrance even serious guards appear. Probably most importantly in this park, is the most beautiful fountain in Kiev. The mystery of the beauty of this place lies in the history of creation. During the Russian Empire there was a chic palace of governor-general, surrounded by a vast garden, built in the XVIII century. At different historical times, it belonged to different authorities and performed different functions-once it had a church, and the General Secretariat of the UNR, and the residence of Simon Petlyura, and the Bolshevik Emergency Commission. And in 1920 the Poles made from it their military headquarters and blew it up during the retreat. This is one of the biggest architectural losses in Kiev. But already in 1925 the Soviet government removed the ruins that did not reside in the restoration and ennobled the neglected garden, having built a house for its elite along its perimeter. There appeared gazebos, benches, statues with a monumental fountain in the center. In the middle of the last century, it even got into the Soviet film "She Loves You". In our time the fountain has been restored - now it has a fabulous look and is made of Chinese marble. Among the metropolitan parks, which are far from the center of the city, Feofaniya is worth visiting. It is an amazing natural sight of Kiev, where landscape designers worked well. In addition to the incredible beauty of local landscapes and gazebos, a complex of lakes and Alpine hills, Feofaniya is also valuable for religious attractions. There is a pilgrimage trail and healing springs "Tears of God's mother ". Also, medicinal plants such as lavender, coltsfoot and St. John's Wort grow here.